The “Search Engine Results Pages (SERPs)” link above (marked with **) includes an alt text SEO test. View HTML source of this webpage and search Google for what is in the alt=”SERP#Test##”. 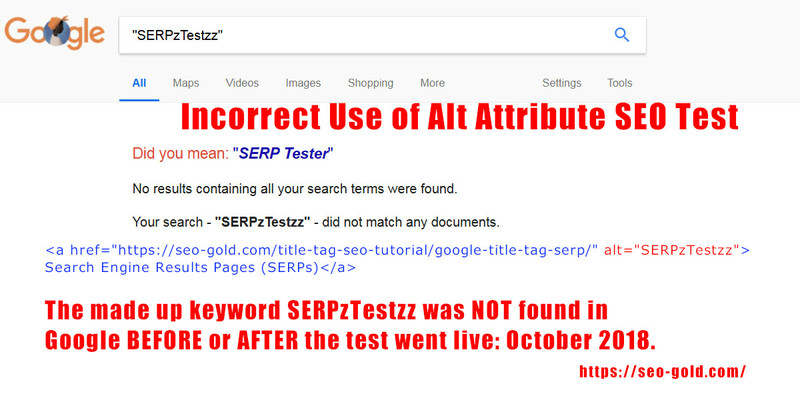 Search Google for “SERP#Test##”, but replace the 3 #s with 3 zs to confirm the SEO test and you will find “No results containing all your search terms were found.” confirming Google does NOT count alt text added to text links: valid test between June 2014 and October 2018. Image above is a screenshot of the Google SERP with the code of the incorrectly formatted link. 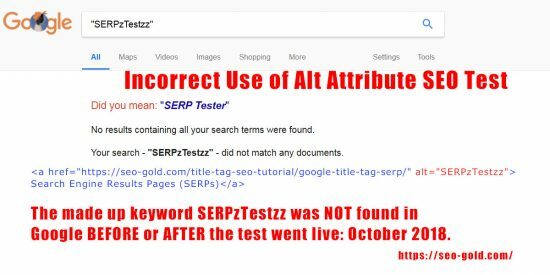 Shows adding an alt=”text here” attribute to a text link is invalid code, which is why Google ignores it for search engine ranking purposes. However, Google does use correctly formatted alt text that’s associated with images as a ranking factor.